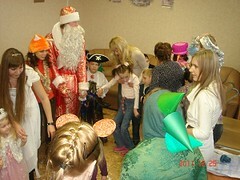 Yelatma is a traditional village 200 km from Ryazan. 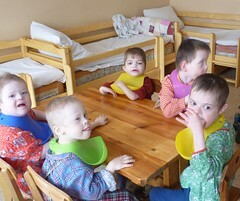 Yelatma has a number of orphanages for children and young people of various ages and abilities. One of these orphanages is run by the Department of Social Development and Labour; closed to most outsiders it is home to 50 severely disabled children aged four to nineteen. Shut off from the outside world none of them attend school and until 2007 many had not left their small beds since arriving. 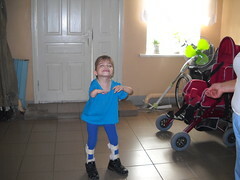 The Director of the orphanage at Yelatma heard of the progress made by children at the Ryazan Baby Home and invited ThePromise to bring Portage to the orphanage. This was a significant breakthrough for ThePromise as outsiders are not usually invited into closed orphanages. Prior to the introduction of Portage, the children stayed in bed all day and were offered no therapy or stimulation and no education. They received their basic needs of food, clothing and a weekly bath. Following a highly successful pilot project with a small group of children in 2006, 32 children aged 4 to 18 now receive Portage from a team of 10 Portage workers. There are a number of children in Yelatma orphanage, aged 9-19, who predominantly have learning and/or behavioural difficulties. For a number of reasons, they are not suited to the Portage programme. 12 of these children are mobile and three have lost their mobility due to the conditions they are living in and lack of stimulation. Before ThePromise started working with them these children spent their days in a small room in the orphanage ‘guarded’ by an elderly woman who would stop them physically harming themselves and makes sure they didn’t escape. They had no toys or books and spent their days sitting or lying on padded mats rocking and moaning as a form of self-stimulation. A television tuned to a channel showing Russian soap operas played constantly. 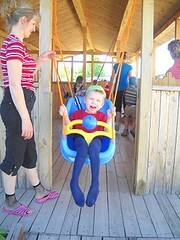 The noise was unbearable for some of the children with sensory impairments. One child had his hands tied as he was considered a risk to himself and others. Working with a UK qualified Occupational Therapist, we recruited and provided training for four Children’s Workers to work with these children. 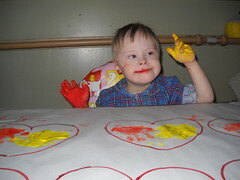 They have developed a programme of activities for each individual child such as learning to communicate with others, going outside with an adult, drawing and jigsaws. We have also refurbished the dayroom and assisted staff to reorganise the dining room so that a corner of it can be used for quiet daytime activities, like storytelling and one to one sessions. In the summer months the children’s workers take the children outside – something that was never done before. The Children’s Workers were trained and supported by our volunteer Occupational Therapist for a year and ThePromise provided all necessary equipment for them to continue their work. 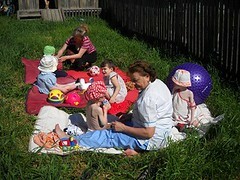 This has been a huge success with many of the young people now communicating, enjoying various activities and some even assisting staff in chores around the home and playing with some of the younger children – a real family feel in a desperately lonely institution.